Twitter account identifies white nationalists who attended Charlottesville protests: In the wake of the white nationalist march in Charlottesville, the Twitter account @YesYoureRacist is doing the Lord's work. I'm 20, Filipino-American and from the South. Here's what I saw in Charlottesville. 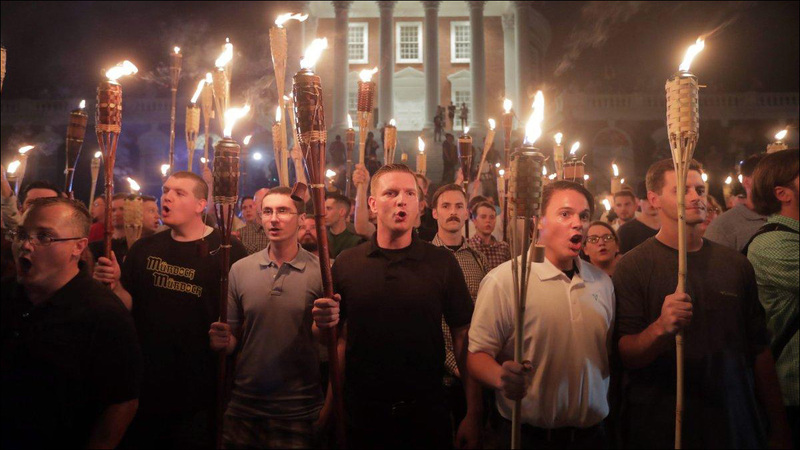 "I witnessed violence firmly take hold in downtown Charlottesville. These white supremacists are as real as the racists of the 1860s and 1960s." Reimagining The New Colossus... in Trump's voice A senior Trump advisor, Stephen Miller, sparked a furor last week when he dismissed the famous poem at the base of the Statue of Liberty. In response, The Guardian asked 21 poets: what type of poem would Trump like to see at the statue? The Uncomfortable Truth About Affirmative Action and Asian-Americans: "But this lawsuit, and much of the discussion of affirmative action that surrounds it, makes a serious error in assuming that, in order to stop discrimination against Asian applicants, race-conscious affirmative action must end." I was asked to speak about immigration in front of 136 new U.S. Citizens, a Federal Court Judge, and a Republican U.S. Senator - Here's What I Said... E.J.R. David, who became a naturalized citizen over 20 years ago, was asked to speak about immigration to 136 new citizens. "As US citizens we now have the power and the responsibility to look up, to see the injustices around us, to hold our heads up against these injustices, to speak out, and to do something to address them. We now have the responsibility to make America better." Minnesotan who witnessed Khmer Rouge terror hopes for justice: Advocates in Minnesota documented the stories of Khmer Rouge survivors to preserve history for future generations. Now, these accounts are part of a Cambodian court’s investigation into those responsible for the atrocities. After Abuse and Prison, a Woman Faces Deportation to a Country She's Never Been To: Ny Nourn has spent the last 16 years incarcerated for her role in a murder perpetrated by her ex, a man twice her age who she says violently abused her. She was paroled earlier this year -- but now she faces being deported to Cambodia. A Hate Crime Exposes Deeper Rifts Between Asian Americans: Koreans, Filipinos, and Indians Have Too Much in Common to Fracture Themselves Along Ethnic Lines. What a FraternityHazing Death Revealed About the Painful Search for an Asian-American Identity: When Michael Deng, a college freshman, joined an Asian American fraternity, he was looking for a sense of belonging and identity. Two months later he was dead. Ava DuVernay Interviews 'Gook' Director Justin Chon: "Isn't It Nice to Hear Filmmakers of Color Talk About Craft?" Directors Justin Chon and Ava DuVernay shared a conversation at Sundance Next Fest after a screening of Chon's award-winning L.A. riots drama Gook. Master of None's Alan Yang on Directing the Friends Parody Video for 'Moonlight' and Making Jay-Z Cry: Master of None's Alan Yang directed Jay-Z latest music for "Moonlight," a re-creation of the classic Friends bottle episode "The One Where No One's Ready" -- except with an all-black cast. What to do when you realize classic books from your childhood are racist: Do you have an old children's book you love? Well, there's a good chance that it might be racist, says kids' author Grace Lin. She offers her humble opinion on how you can keep loving your favorite classics while acknowledging the out-of-date or harmful parts. A Round-Up of Awesome Asian American Protagonists in YA Lit: Add these to your summer reading list: "From the kickass to the troubled, from gay to straight, boys to girls to somewhere in between, from the ambitious, and the humorous, to the stoic, and even more that don't fit in boxes, no matter how much people try to make them, these teen characters are ones we think you won't easily forget." New magazine upends Asian-American stereotypes: Katerina Jeng and Krystie Mak created a new magazine, Slant'd, to tell the diverse stories of Asian Americans.